This summer is going to rock for the PMY staff. Why? 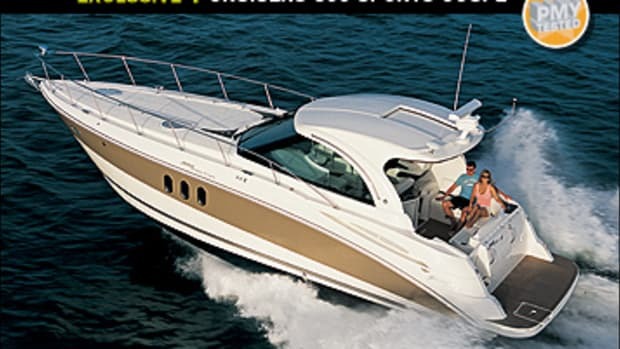 Because this year&apos;s company boat is the Cruisers 447 Sport Sedan. After spending a full day onboard the latest Office Ours, I can say with certainty that over the next five months, the sign-up sheet will be full and her engine-hour meters will put up some big numbers. 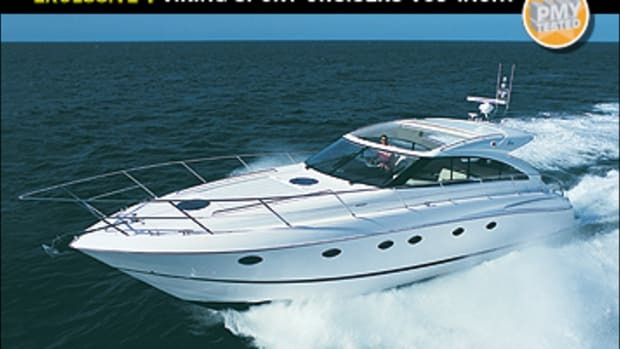 The first thing I noticed about the 447 was her relatively low profile, a positive attribute for a flying-bridge boat. (I researched specs on a few similar-size and -class vessels and found that their bridge clearances averaged a couple feet higher.) With her lower height—the 447&apos;s bridge clearance is a relatively short 16 feet—and with less weight up top, she should ride, drift, and sit on the hook stably. Mike Myers, a naval architect for KCS International, Cruisers&apos; parent company, says that her profile is made possible in part by the choice of V-drive propulsion over traditional inboards. 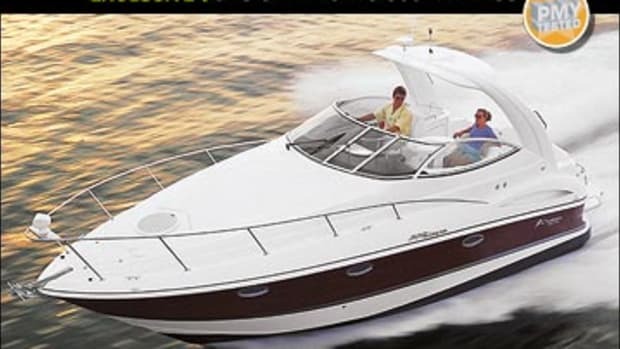 "A normal sedan [with inboards] would place the powerplants first and establish a floor and headroom above that," he adds, noting the end result would be a taller boat. The profile is one part of this vessel&apos;s on-the-water comfort equation, but another is her hull, which is Airex-cored below the waterline and balsa-cored above. 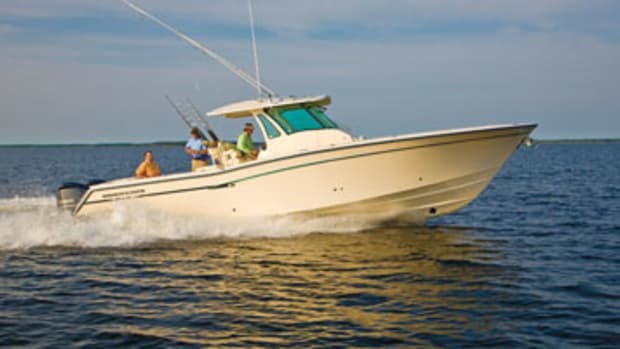 The entry is the same as that of the 45 Sportfisherman built by Rampage, another KCS company. Measuring 45 degrees at its finest point, it transitions to 181/2 degrees at the stern. Myers says that the hull is warped from the transom forward. Office Ours&apos; piercing entry and V-like aft section implies an ability to punch through a seaway but also indicates susceptibility to rocking and rolling when adrift or on the hook. Cruisers addressed this issue by adding secondary, or "trip," chines higher up the hull side. So at rest the 447&apos;s static beam is wider than her running beam, which allows the secondary chines to dampen roll motion. And underway the chines are out of the water, reducing drag and allowing for better performance. When it came to performance, Office Ours&apos; numbers were admirable. 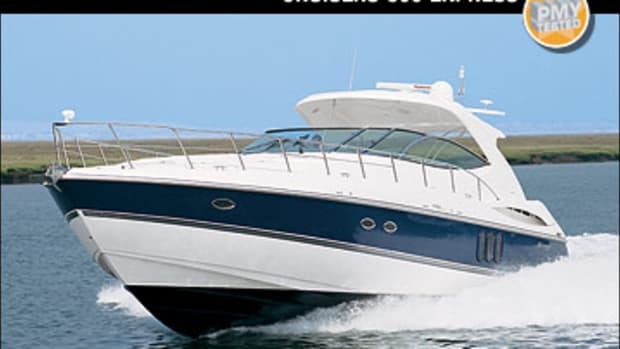 With the largest available powerplant option, twin 480-hp Yanmar electronically controlled diesel V-drives, she got up on plane in about eight seconds and offered a comfortable cruise of 30.2 mph at 3000 rpm across a calm Atlantic. At cruise speed the Yanmars burned a mere 33.6 gph and registered 0.90 mpg. With her 375-gallon fuel capacity, that&apos;s a 303-mile cruising range, which will easily allow us to do weekend jaunts to Cape May, New Jersey, from our New York City homeport in about five hours while burning around 168 gallons of diesel (of course, that wouldn&apos;t include "miscellaneous" costs incurred during a stopover in Atlantic City). A few more gallons, and we could easily hit Ocean City, Maryland, for a long weekend or cruise the Chesapeake and have a weeklong crab fest. If you&apos;re a daytripper and just want to enjoy the wind in your hair, WOT on the 447 is 35.2 mph with this setup. Myers says to expect a little more speed with the IPS version, even though it features less-powerful 370-hp Volvo Penta D6 diesels. You&apos;ll find more responsive handling with the IPS version, too. 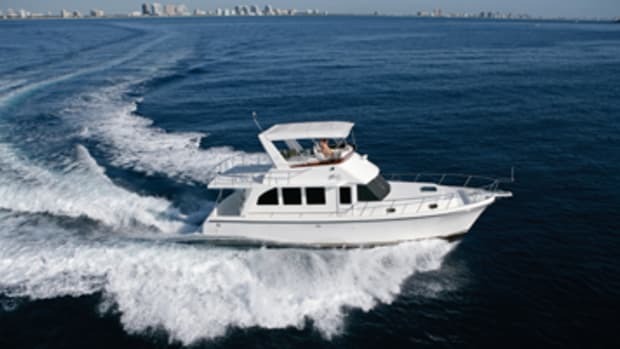 The standard Teleflex SeaStar power-assist steering will help you hold course, but this vessel takes wide, three-plus-boat-length turns with the wheel hard over at cruise speed, so larger rudders may be in order. However, at slow speeds I was able to spin her with ease; a little input from the optional Side-Power made docking maneuvers downright speedy. 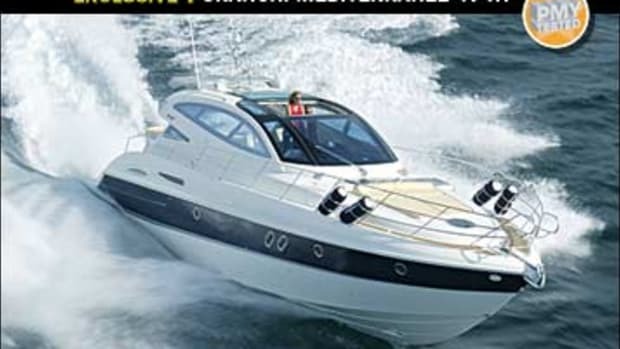 But a boat like this is not just about WOT and S-turns, especially with the social crew here at PMY. Entertaining is a key component, and Cruisers has addressed this need quite well. The flying bridge offers an alfresco party place with lounge seating just abaft the helm and two tanning-friendly chaise lounges on the flying-bridge overhang. To whet your whistle, the cockpit is armed with a wet bar and ice maker. 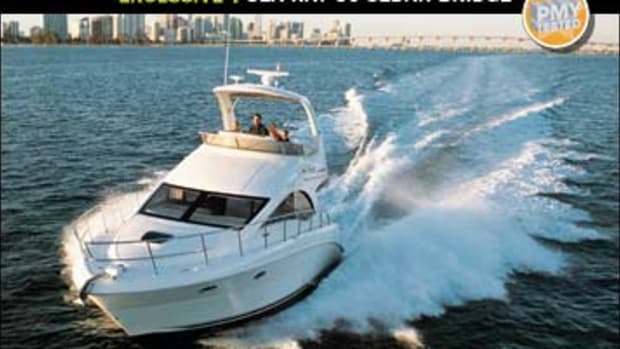 The full-beam (14&apos;6"), wide-open saloon, accessed via the cockpit&apos;s sliding-glass door, provides an inviting indoor entertainment venue with standard port and starboard lounges. (The port lounge has a double incliner, and the starboard one is a sofa/ sleeper.) Both offer a clear view of the standard 23-inch Sharp LCD TV for movie night. The saloon&apos;s open arrangement is enhanced by 6&apos;7" headroom. Standard cherry warms up the interior, which is further brightened by wide side and front windows. 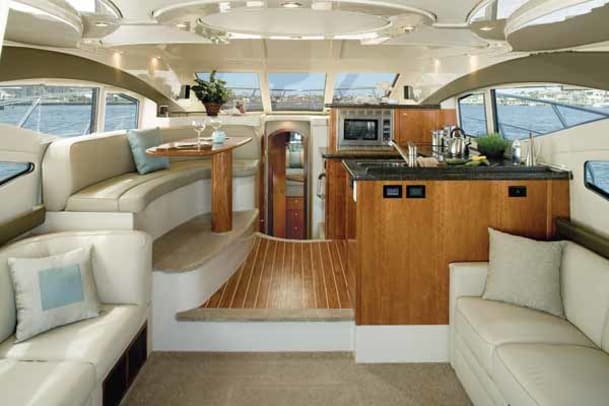 There&apos;s no feeling of sitting in a hole in this boat, especially since the galley and dinette are up one step from the saloon, with clear views in all directions. All the requisite galley tools are available for the cooking cruiser, including a EuroKera cooktop, solid-surface countertop-prep areas, and a Nova Kool refrigerator and freezer, all standard issue. After considering the ride, layout, and amenities of the 447, I found her model designation Sport Sedan to be spot-on. 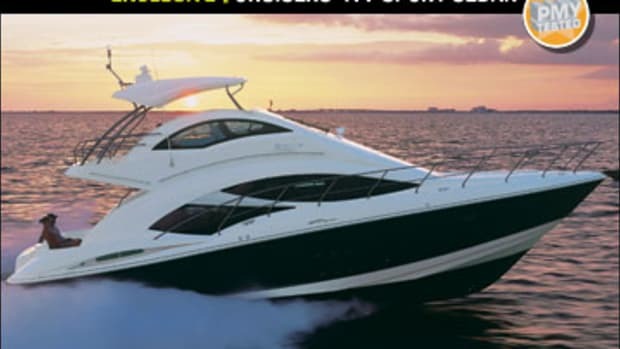 The helmsman will appreciate the racy side of her as indicated by her speed and smooth ride. Yet, her performance didn&apos;t come at the cost of shoehorning huge engines into a tight space. As a matter of fact, I easily managed my 5&apos;7" frame through the cockpit hatch and accessed between the powerplants to check oil, filters, and the like. In addition, Cruisers has labeled every hose, wire, and through-hull, a great attribute for the DIY boater. And on the sedan side of this boat, she&apos;s simply cozy. The soft tone of the cherry, lighting, and her two-stateroom layout make you want to toss off the lines, make way for destination anywhere, and drop the hook when you get there. And I think the PMY crew will be doing just that. 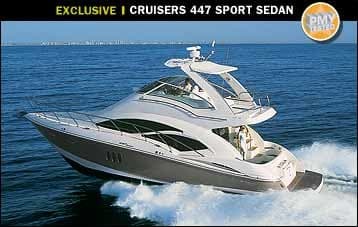 So look for us this summer in our 447. We&apos;re coming to a port near you.